I created this drill to teach my players to receive a pass & then look for passing options. It also helps develop quick decision making skills. Start out with two lines above the blue line face-off dot. Player 1 skates around the cone at far side blue line dot. Player 2 as player 1 makes the turn feeds player one with a leading pass. He then follows player 1 to the net to pick up any rebounds left by the goalie. 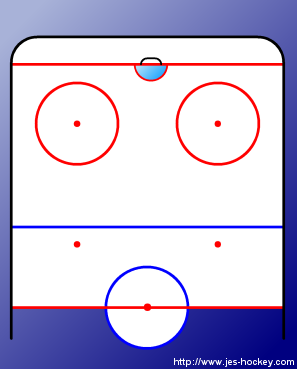 Player 1 must look up and find the coach who is standing in front of his cone and make a pass. If no coach is in front of his cone he takes the puck in for a shot. The coach will feed a pass back to player 1 for a shot on goal. Players continue to play the puck until they score or it is covered by the goalie. They then return & switch lines. 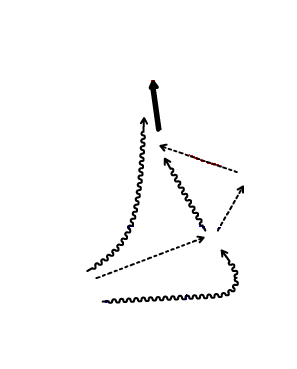 Coaches vary who is in front of a cone and the cone positions can be changed.